I was talking to a technology provider the other day who said they were having a tough time managing the expectations of their clients. Through the conversation they were questioning how ‘far the extra mile’ they should go to address implementation and other project issues. My view was simple: Customer Service is not defined by getting it right first time; rather it is defined as how well you recover when you fail to get it right the first time. The company that goes the extra mile to recover a bad situation will always be thought of in a more positive light than the one that does not. It does not mean the relationship will always be saved, but it generally it should result in neutral to positive press from the customer. This conversation and the concept of customer service got me thinking about another topic that is close to my heart; the gulf between what businesses want and what customers value. These two outcomes are generally exclusive. You can’t do both. The manager’s job is to find the balance. Part of this balance is recognising that you can’t make everyone happy and there are customer profiles that just fall outside of the target market. To delve into this more fully requires us to revisit first principles. Consider the following model. It represents the typical business view. Every business has its objectives. Typically cost, quality and service. Business processes are designed to create the organisational capability required to meet these objectives. Investment is made in IT, People and Plant to enable the process capabilities. In less convoluted terms – the enablers create the process capabilities required for the business to meet its objectives. On the other side of the ledger is the customers view. Customers don’t have objectives. They have values. Know who I am, Treat me with respect and more. The customers model looks like this. There is obviously a high degree of overlap between the two models. In fact the only difference is at the ‘end game’ between the two ‘interest’ groups. The objective is now to manage the inherent conflict between these two competing outcomes. This is highly relevant as many businesses spend considerable time refining each model without fully embracing the common areas between them. A company can only have one set of processes. Work comes in the back door and goes out the front door. So when a manager is defining efficient processes for cost reduction they should simultaneously be defining the process for improved customer value management. This is less important for back office processes, but not unimportant. Consider the credit check process. The customer does not care about the credit check. They just want to purchase their goods or service. The business wants to complete a credit check to avoid bad debts. The question is which action will create a better gross margin. Reducing the process costs through headcount reduction or increasing the process costs to reduce cycle time to minimise the time customers have to dwell on the fact you don’t trust them and to change their mind about the purchase. I realise the answer is to chase both outcomes. But a process is designed for the average and this exacerbates conflict. How do you address specific transactions as become ‘less average’ and more complicated and. The initial answer is policy. Policy allows you to treat customers as individuals, each on their own merits. But policy creates risk, training needs and recruitment needs. Allied to this is the model by Zeithaml. His model describes 5 gaps between a business and the customer. These gaps are all relevant in minimizing the conflict noted above. 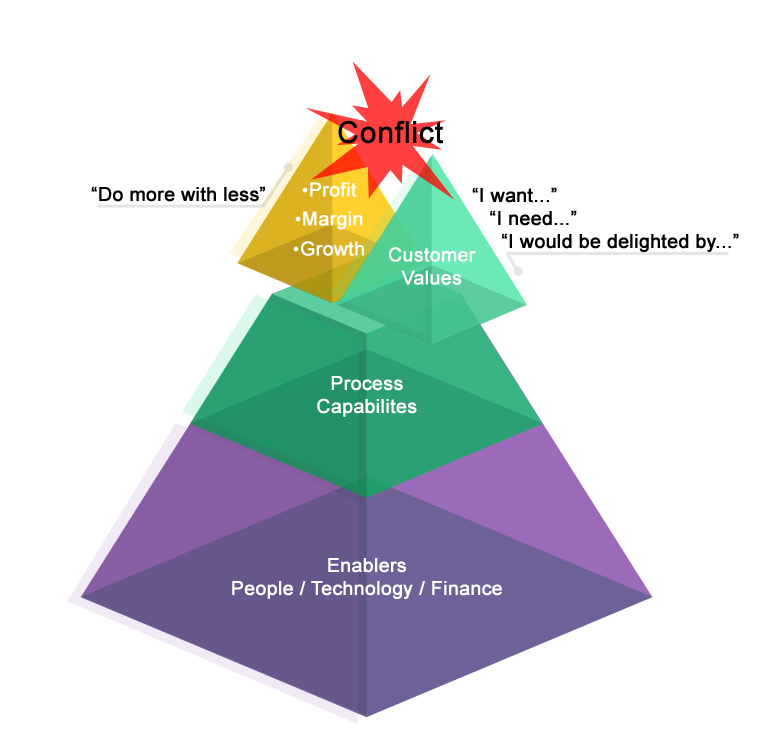 Gaps 1 and 4 are closely related and are the gulf between the messages a company creates and puts into the market place and how those messages are interpreted by the customer. This includes the content and medium. Depending on how a message is interpreted dictates the expectation by the customer of the type of service they can expect when dealing with that company. This gap is key, because everything follows from it. This is when we tell the customer what we will do and what to expect. It includes everything from direct conversations (over the counter / telephone etc) to corporate advertising. Consider; Optus says “Yes”. That is a great marketing position aimed at the average. The individual that gets told “No” is going to have a different view of that message. Woolworths say they are the fresh food people. Not a good look when the weekend produce is not that fresh. Gap 2 is between what the company is telling the customer they will do and what they are actually designing their processes to achieve. This is an internal gap between marketing and operations. Using my Woolworths example again, Marketing says we’re the ‘Fresh Food People’. This may be true for metro stores, but as the supply chain stretches to further destinations, this message gets substantially more difficult to substantiate. To mitigate this, does Woolworths change the specification of what it means to for food to be fresh, depending on geography or other demographics such as average income. Can ‘Fresh Food’ mean different things to different people? I think it can. Target marketing can cause people to see things differently depending on where they live (interact with the messages). Notwithstanding this gap is important as is sets the company up to meet (or not) the ‘contract’ it has set with the customer as to what they can expect from the company. Gap 3 is between the service quality specification and the actual delivery, as perceived by the business, not the customer. For the record, I don’t know if Woolworths changes their message for the country regions. The sign on the trucks stays the same. For this example I will assume that it does largely stay the same and that the quality of the produce sold in the country regions, is not as good as that in the city. From a business point of view this is fine as you may get a higher margin in the city. From a customer value management point of view, this is fraught with danger. The country shopper who sees the message that says – Fresh Food People – but due to supply chain issues, can’t buy fresh food daily, may be forgiven for feeling undervalued and believing that Woolworths treats them as less important than the city folk. This was just an example. I used it as everyone understands what fresh food means. I don’t know how Woolworths manages country destinations. But it does highlight the need to minimise the gap between the marketing messages and the capability/capacity of the business operations. 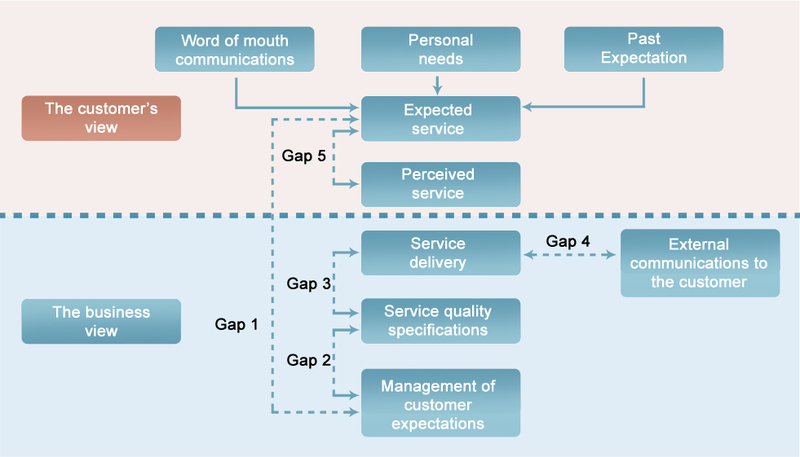 Gap 5 is the between the expected service quality and the actual delivery, as perceived by the customer. By managing ‘gaps’ 1 and 4, the business has set an expectation of service quality in the customer’s mind. Gap 5 is the determination by the customer as to whether they received the expected quality. 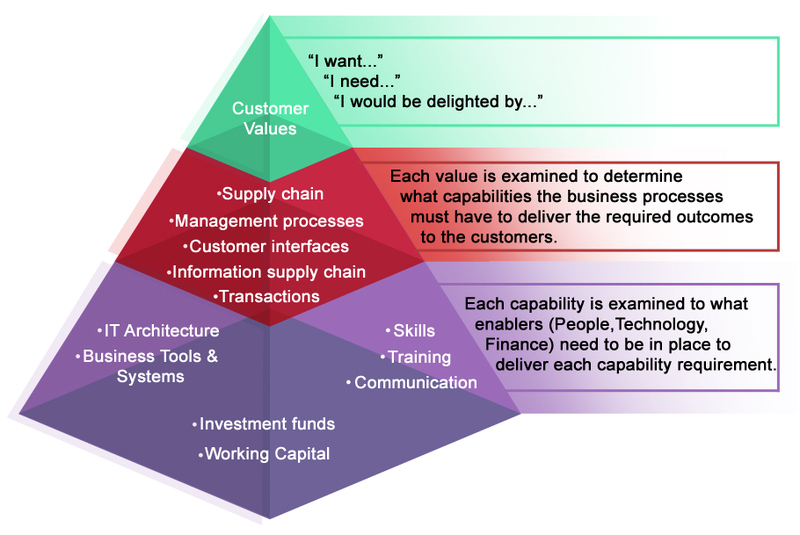 I believe the model could be extended to a sixth gap – namely the gap between how the customer expects the company to resolve a shortfall in service quality and how it actually does. In a previous lifetime I worked at a dairy as a brand manager. We would occasionally get complaints about the milk. Immediately on receiving the complaint, I would post the customer a card thanking them for taking the time to write in and I would enclose two vouchers for free milk at their local. An analysis of the complaints showed that more than half were due to problems beyond our control. In one instance we were not even the right dairy. But a follow-up with the customers showed a 100% satisfaction rating with our response. The card, the vouchers and the follow-up. All way more expensive than a bottle of milk. But we kept the customer and they told their friends that we were a good company to do business with. This sixth gap is really overlooked. Millions of dollars are spent on winning and delighting customers, only to short change them when things go awry. My opinion is that customers expect you to do what you said you would and to fix it when it goes wrong.